Well, I was actually there on the evening of Monday 24th too… not fishing but eating BBQ burgers and drinking lager… oh yes, that was preceeded by a couple of hours grass cutting on a club work party… 🙂 But I did make extra use of that visit by pre-baiting my swim for the actual fishing session the next day. Baited with 50/50 Sonubaits Choc groundbait and my homemade crumb supplemented with dried blood and mixed particles. Weather over the course of the day was quite pleasant, warm with just a gentle breeze roughening the water’s surface from time to time. So, I arrived at the pool and was set up and fishing by 0600. Added extra feed over the top of the previous night’s but, as I had run out of the Sonubaits Choc, I substituted for that with a silver fish red mix bait. And during the day I regularly catapulted a small catapult (*) pouch of dead red and white maggots – virtually every cast and if leaving the line in water longer than usual then every 3-4 mins. Finally packed up at 1600 after getting my end tackle in a complete pickle when a fish I’d hooked jettisoned the hook, the tensioned line thus catapulting up a tree alongside the swim – got from the tree OK but shot and float had wrapped around each other in an unfastenable knot and the only way to recover from that was to cut out the knot and strip and completely re-tackle but I hadn’t intended staying too much longer anyway and so decided to call an end to the day at that point. As for actual tackle and method then then, using the tackle setup as described in ‘Session 28’s blog, I again used the laying-on method. 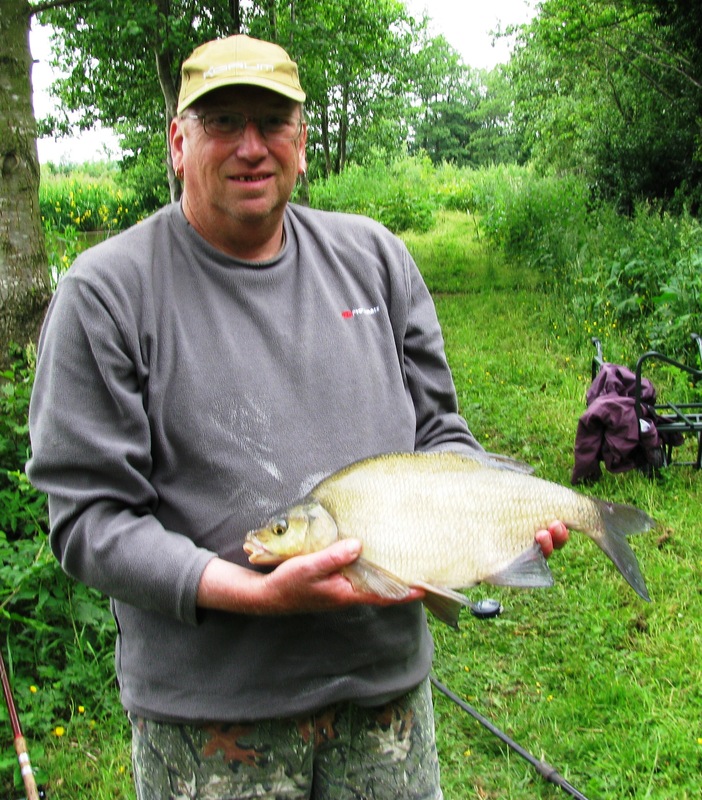 I also lost one good sized perch and 4 other decent sized fish (tench possibly) on hook pulls…. 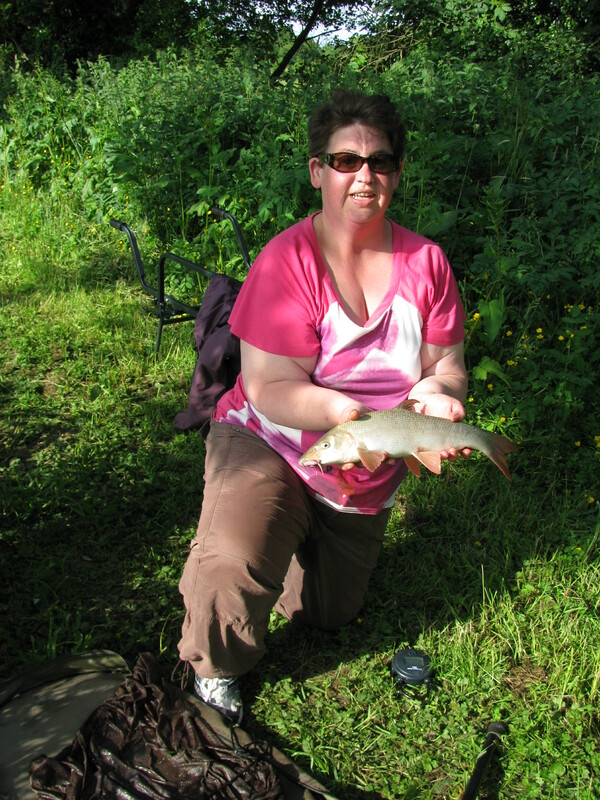 Session 28 – A 12 Hour Visit To The Tench Pool With Liz. OK… on Friday 21st June 2013, Liz and myself set off from home at 0700 heading to our club’s tench pool. Weather at the time was a very misty, very fine drops of rain in the air type but over the day it cleared mostly to give bright but overcast conditions with a few sunshine breaks but also a couple of light 5 minute showers in the late afternoon/early evening but so light that basically they were noticed by the rain drops on the water rather than actually being felt or wetting us. On arrival, we selected a pair of adjacent swims with a lily pad patch between us thus allowing us to both fish on the edge of them. I then threw out a few balls of groundbait (a 50:50 mix of Sonubaits Chocolate Groundbait and homemade white breadcrumb with added 10% dried blood and 10% ground seeds/peanut kernels into each swim and over this was added a few handfuls of particle mix consisting of maize, wheat and hemp in the main. And whilst fishing we fed, via catapult on a little/often basis numbers of dead red and white maggots into our respective swims. Both of us fished similarly in the main – 13′ float rods, 6lb main line straight through to size 16 or 14 barbless hooks, 6BB onion float overshotted by use of 1 x 3SSG shot 3″ from the hook and 2 x AAA shot just below the float to fine tune the over-weighting – and the float-to-hook distance set to about 12″ over-depth to allow perfect setting of the float by a light tightening of the line. Liz did have a slight change of tactic – for about 30 minutes – as there seemed to be a lot of fish activity in the upper layers – and I set her up a self cocking float with 2 x No.4 shot spaced down the line, thus allowing the bait to sink slowly through the water, and the float-to-hook length set about 3/4 of the actual water depth. However, this did not result in any bites at all and so she switched back to laying-on. So what did we catch? 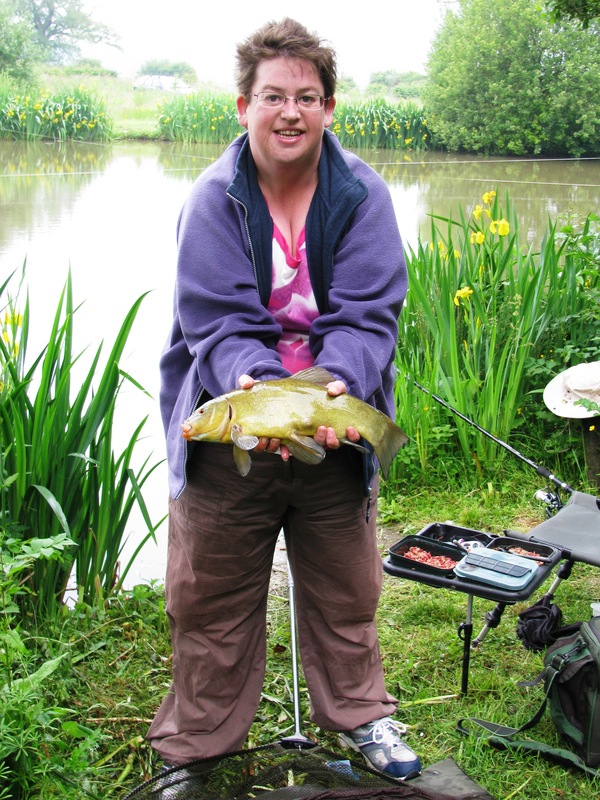 Liz had 4 fish in total – and lost 2 when they made the sanctuary of the lily pads throwing the hook. And I had 5 in total – losing 5 or 6 fish – mostly in the lilies late in the day when they gained sanctuary there and threw the hooks – but didn’t have one breakage. They just seemed at that time to take the bait and dash straight there – even when fishing several feet away and trying to strike-and-hold they sprinted and forced their way there. I did lose one nice sized perch too early in the day when it rolled on the surface and the hook came adrift. At this pool, despite its shallowness – virtually a constant 4′ 6″ with an occasional 1 metre-square sized hole of 5′ (well, that what my depth-finder has seen when I’ve sent it over the pool on the back of R/C boat) – the tench, when they feed, do feed constantly throughout the day – come unblinkered bright midday sun or dull overcast conditions. And there were tench bubbles fizzing like a bottle of shaken up Corona for most of the day. Also you never know what else will turn up at this pool… those barbel for instance, the bream of this trip were my first bream from this pool, but there are also plenty of roach/rudd, perch, crucian carp, gudgeon… in fact, everything except ‘common’ carp for which there is a separate pool alongside but it seems that some may have made a journey anyway as young stuff through the pipe that connects the two pools as I have heard that there are in fact carp in the pool now – and also the ‘carp/chub only’ pool certainly has many 1-2oz roach in there – and in fact if you want roach then you’ll catch more from the carp pool than their ‘home’ pool. Personally, I could do without the carp in the pool – plenty of them in our other pools (plus that carp pool alongside) and really they do become a nuisance when you’re hoping for other species and all you catch are carp, carp and more carp. Anyway, at 2000 we decided we REALLY must leave for home – packed up the barra’ – properly balanced this time which made it a treat to use – made our way to the car and thence home. As many other angler’s believed, I was of the opinion that live maggots, when fed into a swim with a silty bottom, buried into the silt. And I always thought that this was possibly good in that it would encourage fish to stay around longer and to dig around to locate these buried ‘treasures’. However, it has come to light, thanks to the latest underwater videoing projects, that this is not true at all! What happens is that the maggots crawl out of the swim entirely ie would seem to start encroaching into your neighbours swims and at first thought/sight it may seem that this is far from productive for yourself but great for your neighbour as the fish follow that great maggot expansion. But then I thought again… as the maggots disperse then so will their ‘density’ ie if at the point of introduction there are 100 maggots within one foot of their entry point then as they proceed outwards (and assuming a perfect spread), due to the inverse square law as they reach 2 feet away there will be a density of 1/2_squared (1/4) of the original ie 25 maggots per square foot and as they reach 4 feet then their density will become 1/16 or 6.5 maggots per square foot. Thus it is easy to see that by the time they’ve reached 30 feet (and remember we’re not allowing for maggots being gobbled en-route either) then your neighbours swim will probably receive less than 1 maggot for every 100 that you feed! Not a lot! BUT the dispersion could also work as a BIGGER advantage for YOU than the burying scenario…. BURIED maggots will possibly HOLD fish in your swim longer than they would remain normally, but DISPERSING maggots will ATTRACT from outside the nominally baited area by spreading and at the extreme edges of the spread the ‘light’ sprinkling increases perfectly in density as it comes in towards the epicentre where the maggots are being introduced to draw, by enticenment, the fish inwards to your actual baited/fishing area. 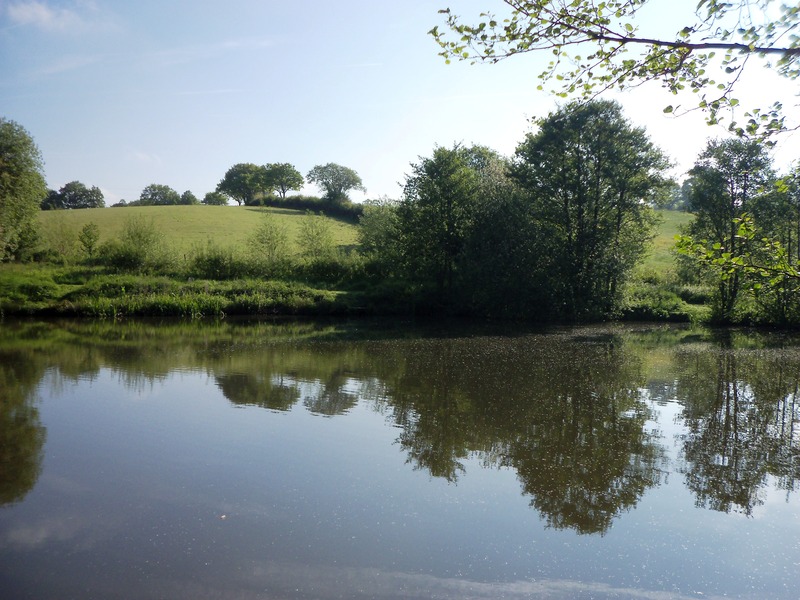 Yep, yesterday (18th June) I visited the River Severn at the BAA’s Knowle Sands fishery on my first river session of the new season. Day was bright but not ‘sunny’ and was very warm and humid. Arrived at about 7:30am at the Section 3-4 car park and proceeded down to the river side – all looked good bar maybe a little on the low side. Had a wander down 200-300 yards of bank on Meadow 4 but was unable locate a decent spot to fish and so I headed upstream onto Meadow 3 where I found a nice looking area. Fished there without a touch for 2-3 hours fishing meat then moved a little further upstream and fished meat, cheese paste and pellet paste for another 2 hours or so. Not a single nibble all day as you can surmise from the title of this page – be it from barbel, chub or anything in fact. 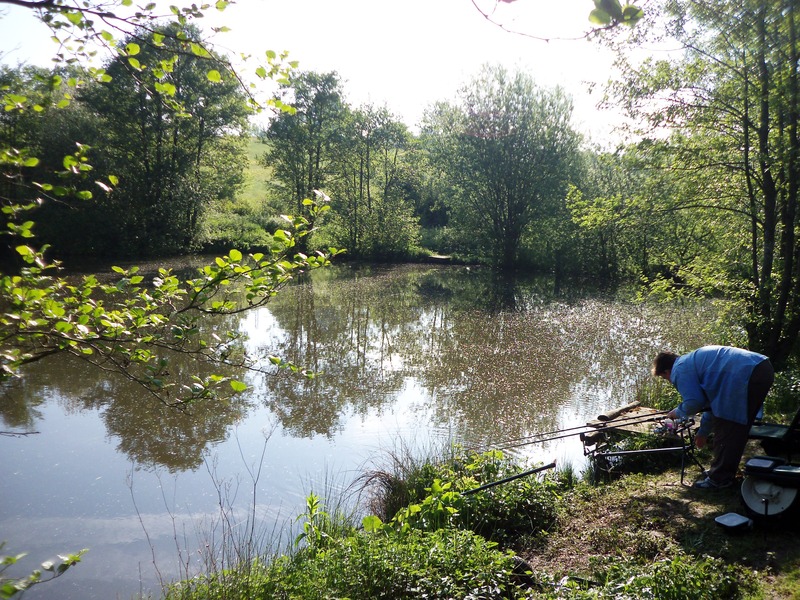 My best mate also fished the same stretch – 3 swims, 2 rods, 3 baits – for a good 4 hours and also was completely biteless in that time. Oh well, I suppose I’ve got my session 28 to look forward to – a tench session with Liz on Friday 21st at the club’s pool. Today Being Sunday 16th June 2013 – So Why Am I Here? 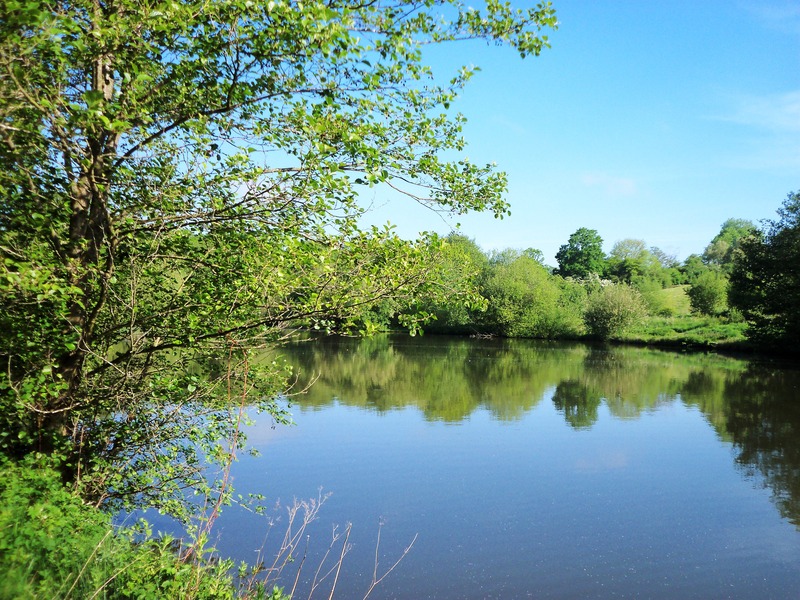 Yep, today is the opening day of the 2013-2014 river coarse fishing season – yet here I am, miles from the river – or any waterway come to that… why?? Well, a couple of factors really. I was out at Alton Towers yesterday sampling as many of the rides as I could – including the new Smiler, which incidentally is to be tried before you die, or at least tried AS you die it might be said! – so that was a long tiring day, and with a strange and wonderful array of roller coaster based dreams all night and a late rising – and no tackle/baits are prepped. And, yes, its a Sunday – bad. June 16th – bad. Sunday June 16th – expotentially bad as the world and his son (and daughter for you PC’ers) will be lining the banks and doing a re-run of the Coventry blitz with leads and feeders causing eruptions of volcanic scale all along the banks. Very rarely will I fish anywhere on any Saturday or Sunday… and so Saturday/Sunday June 16th are a definite no-go for me. So my plans for my start of the river season are based around a visit to the Severn on Tuesday 18th. Targets being barbel primarilly with chub as a secondary. Actual location to be visited is still under consideration, but will likely be one of several BAA sections with one of those being a very strong contender at the current time. So tomorrow (Monday 17th) will be spent in prepping my rods, tackle bag and baits. I will be aiming to travel light (well, as light as one can with several 2oz and 3oz leads and possibly a couple of 4oz’s too in the mix). I’ve found an ‘old’ (well, bought a long time ago, used twice actually) leather bag thing that’ll be great for the bigger leads – its actually a bit like a cross between a ‘bum bag/fanny pack’ and a shoulder holster – triangular shaped with several pockets, the top strap fits over the right shoulder and falls diagonally across the back ansd around the front to meet the bottom left corner of the bag at the waist – so its great for spreading the weight across the body. I think I paid about £4.50 for it at the time from Bilston Market. Will take two rods – my 2lb TC TFG Barbel rod and a lighter backup one – probably one of my old Winfield 1.75lb TC Specialist Angler rods. 10lb or 12lb mainlins will be used, dropping down to 8lb, possibly 6lb for chub. Baits will consist of meat (various flavours), cheese/paste, pellets and pellet paste, worms, slugs if I can locate some nice black ones, probably take some maggots and corn too. Hemp/wheat/maize for feed purposes. OK – so that’s the plans – so what’s been happening in the meantime..? A couple of pots of each of 2SSG and 3SSG shot are also on the way. Very useful sizes in my opinion. 2SSG is great for shotting a 3AAA float for ‘laying on’ (2AAA=1SSG … so a 2SSG overshots a 3AAA float by 1AAA which is usually about right to combat water drift which can cause the shot to be dragged along the bottom)… similarly a 3SSG is great for a 2SSG+AAA/5AAA float. Also they are good for light legering in that a spaced out string of shot will hold bottom far better than an identically weighted single lead (inc coffin or pyramid) – take a 1/4oz ‘lead’ (non-toxic weight really) connected to the mainline either directly through the eye of the lead or on a link of line, the flow of the water on the line will attempt to lift the lead from the bottom and thus decreases its effective weight and the combined pressure on line of lift and push will cause the line/link to start to bow downstream and cause the lead to eventually lose hold and shift… however, a string of shot acts so that water pressure on the highest (closest to the mainline) causes it to lift but this is moderated by the next shot down which itself is held low by the next shot and so on and so the overall chain of weight is more parallel to the flow and the current’s effect is attenuated. Effectively, it will be found that a chain of 3x2SSG shot (9.6g total weight) spaced at 2″ intervals on a link will easily hold current better than an 1/2oz (14g) single lead and often better than a 3/4oz (20g) lead. And that excludes the other attribute that due to the length and flexibilty of the link/chain that it can ‘snag’ around small pebbles, in light weed, etc which will also help to keep the weight stationery in the current. However, in a place of heavy snags this latter can also be a disadvantage… but then again if the shot are only gripped to the line as tightly as absolutely necessary then its possible that on severe snagging that the shot(s) will slide off and the rest of the end tackle retrieved without problem. After the visit to Nordley Pools last week, and the umpteenth fallover of my current tackle truck (see photo) requiring an unload, uprighting and reloading, I’ve now purchased a fishing barrow – I’ve bought the Des Taylor Transformer barrow with sides (photo) from FishTec with a special offer deal of £49.99. 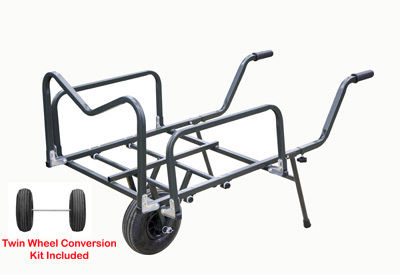 A single wheel barrow, it comes with a 2-wheel adation kit too. Looking forward to this as on the current trolley space and size is limited and hence whilst pushing trolley we still have to carry buckets, rod holdalls, etc – I say ‘we’ as the situation is amplified if Liz and I are together but even if changed to ‘I’ then still the same situation occurs. But with this all bags, etc, including the rod holdalls, should be able to be put on board. Ok, that’s all for this posting…. 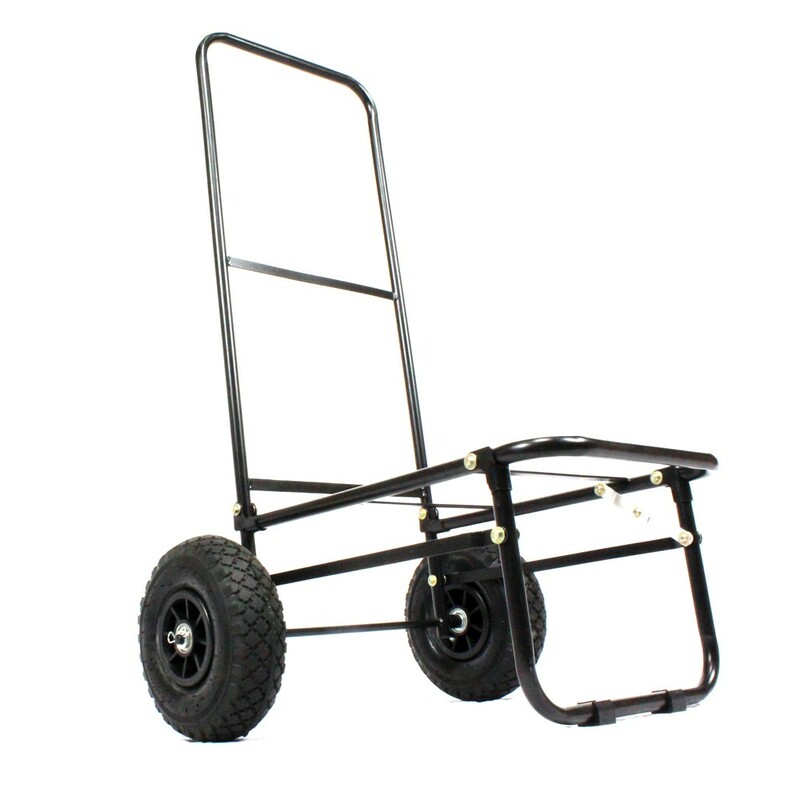 The ‘old’ trolley and the ‘new’ barrow…. Had a bit of a hard day yesterday with planned household jobs having to make way for unplanned but urgently needed repairs that became apparent when starting the planned work plus weather forecast for tomorrow is not so good either – so brought forward the plans to fish tomorrow and headed off to the Staffs-Worcs canal at 0430 this morning. Made my way to my favoured swim arriving there probably around 0500 – 10 minute drive from home plus 10 minute walk to the swim. Tackled up my Des Taylor Avon System rod using the quiver tip top section with lightest tip installed, 6lb Berkeley Trilene line, 1/8oz leger and a size 16 hook on 6lb hook length attached via link swivel. Fed maggot over to the far bank during the session on a little and often basis, and started with double maggot on the hook. So, I think I may be trying that dip/glug again (and others too). It did, to me, have a noticeable albeit not dramatic effect but I’m not sure if that was real, psychological or coincidental or a mix of all three – but it HAS given me confidence to use them again on other times and at other places too. They will certainly be given an outing on Friday’s planned session 27 visit to the tench pool with Liz. Session 25 – In Which I Earn A Chequebook And Pen…. There are 6 pools there and on this session Liz and I chose to fish Pool 3 – the second time we’ve fished this one. We’ve not fished Pool 1, have fished Pool 2 once, the first time we ever went to Nordley, Pool 4 we’ve fished several times, Pool 5 I’ve fished for about an hour (was a wander visit when fishing Pool 4 once), and Pool 6 is very small and usually full of duckweed and unfishable anyway although yesterday it was clear of the weed. We set off from home at 0630, arriving at the pool around 7:30am and selecting to fish the car park side of the pool a couple of pegs up from the near corner. I baited up with a few balls of white breadcrumb laced with particle mix and dead maggots to start the day and we occasionally topped up area with particle and maggots mix via catapult throughout the day. The day was bright and sunny throughout albeit with a chilly easterly breeze predominantly that made for a shiver or two when the sun was obscured, water very clear. 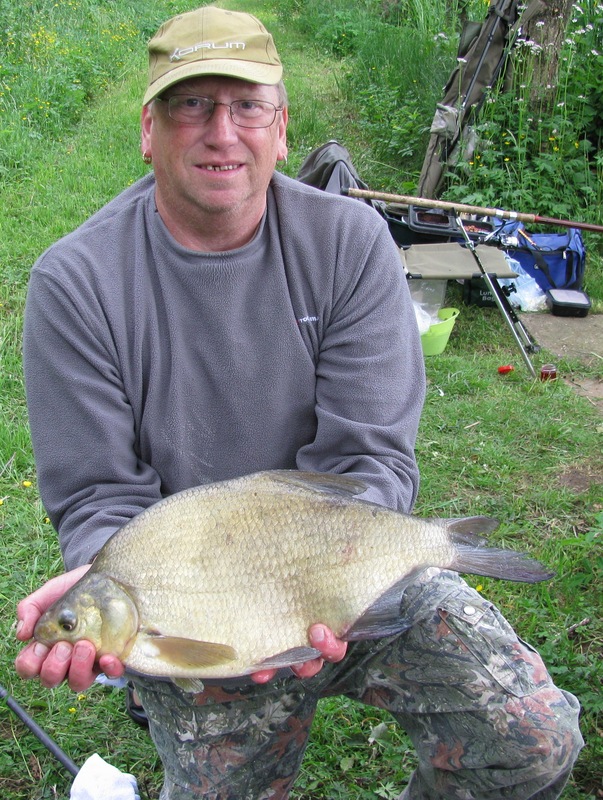 Set ups were 2 rods-on-pods – 1.75lb TC rods, 8lb line straight through. My rods were straight legers, Liz’s with feeders. For bait I used at various times bread, cockles, prawn, sweetcorn, and meat on size 6 hooks, and Liz generally used maggot and corn on size 12s. I also, later in the day, with cruising carp visible tried catapulting out floating baits (crust and dog biscuit) to no avail – and Liz switched to floatfishing maggot on one rod (her 13′ float rod) whilst still ledgering with one of the original rods for the last couple of hours. Results of the day – not one touch at all for me, and Liz managed to catch 2 perch of 1-2oz on the float rod and had a couple of twitches on legered pop-up corn. There were certainly signs of fish – with bow waves, jumps and ‘sharking’ (back and tail showing out of water) especially later in the afternoon but as I say they weren’t interested in feeding, even on the surface. 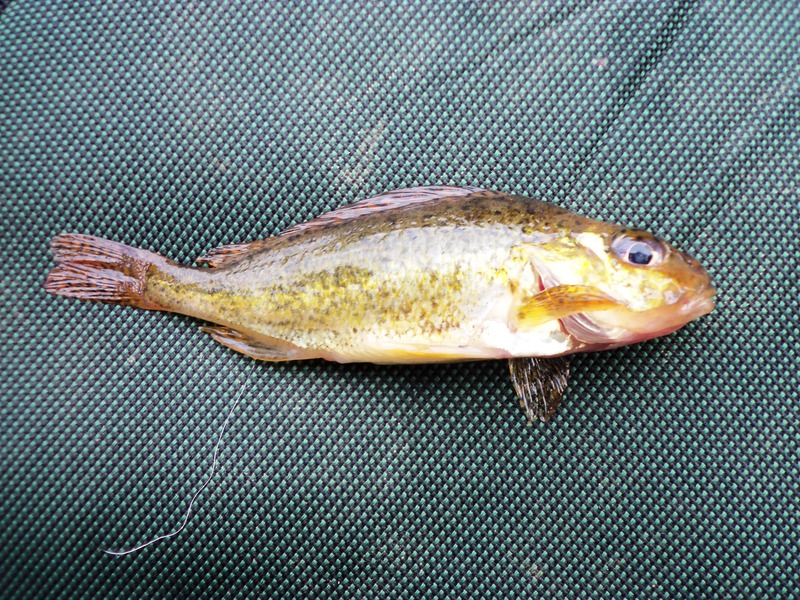 Also it was good to watch a bit of nature at work for a couple of minutes – there was a small bay at my peg and a large shoal of 1″ fry were herded in there by a few 4″-5″ perch and, when they were entrapped there, the perch made a charge into the ‘fry ball’ causing major panic! OK, that’s that then for now…. and now thinking of session 26 – probably an early morning canal session on Tuesday 11th…. 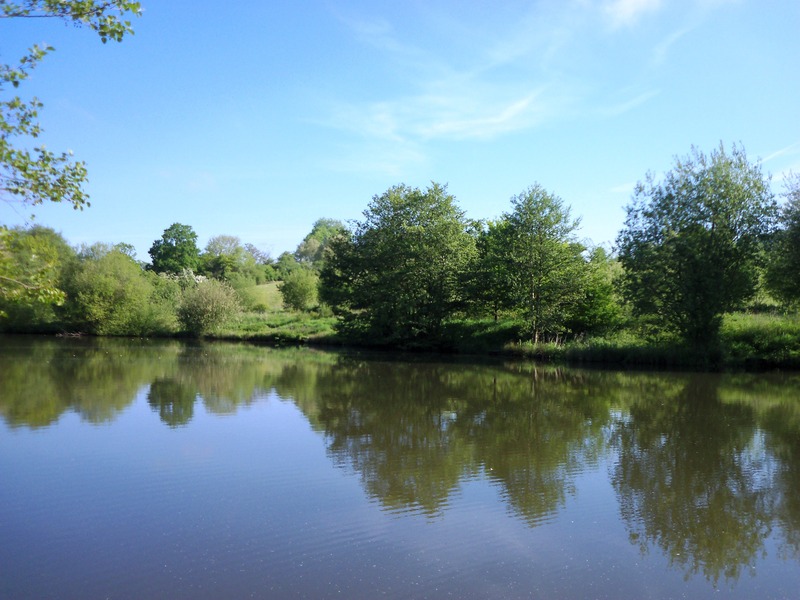 and session 27 – possibly carping on a club pool on Thursday 13th … and session 28 when I should be on the first session of a new river season on the River Severn on either Monday 17th or Tuesday 18th. Well, on the morning of Sunday 2nd June 2013, I awoke to the alarm’s bleeping, crawled out of bed, looked out of the window … and no snow!! So it was down for breakfast and coffee and the last bits of bait packing, and by 4:30am I was on my way to the club’s tench pool (well, we call it the tench pool as that is usually the main target but it contains virtually everything except common carp, catfish, sturgeon and alligator gar ). There is actually a ’common’ carp and chub pool alongside too (called, unbelievably, ‘the carp pool’). However, there appears to have been some crossover of species – probably fry from each pool migrating across the via a connecting pipe (water from a stream runs into the tench pool, then exits through a pipe of of domestic drainpipe proportions into the carp pool, and then excess water exits via another pipe back into the stream… there is also a bypass pipe in the tench pool that allows water to overflow to the stream from there in ecvent of the connecting pipe blocking… Anyway, there are a few carp in ‘Tench’ and a lot of 2-3oz roach in ‘Carp’. Arrived at the pool, baited up my swim with Dynamite Bait’s ‘Frenzied Particle Mix’ with a few maggots and casters added. Usually I prepare my own particles but I hadn’t got round to doing fresh and the previous batch had reached the end of its life… but it was the beginning of June and so I’d my monthly ’20% off one item of bait’ offer from Go Outdoors to take up. So I got the particle mix for this month… Also during the whole session I made frequent additions of maggots into the swim via catapult. At 0545 I made my first cast… I fished with a 13′ Hardy Matchmaker copy float rod (built using the same materials – blanks, rings, fittings, etc – as Hardy themselves used but cost £17 instead of £30 IIRC at the time)… line was 6lb Berkelely Tri-Lene… straight through to a size 16 B981 Kamasan barbless hook… for a float I chose a 2SSG+ driftbeater which was fished overshotted, with all the shots (1 x 2SSG, 1 x AAA, and 1x BB) bunched 3″ from the hook and with the heaviest closest to the hook and the depth between float and shot was set at 3″ overdepth – the pool has an almost perfect flat bottom and a depth of 4’6″, so the bottom shot to float distance was set at 4’9″). At 0630 I had my first fish of the day – a small roach of 2-3oz taken on double maggot. For the next 30 mins then I had not a touch and so decided to try a brandling and at 0710 I was into a good fish, but unfortunately it was lost when it managed to gain sanctuary in the adjacent patch of lily pads and the hook pulled free. And this was the start of worm baits including worm/maggot cocktail throughout the rest of the session with only_maggot tried but seemingly ignored as not the slightest bite indication was observed. I also tried cockles (good for tench) and prawns (good for perch) but despite having minor nudges/aborted takes nothing actually resulted from their use. At 0715, another bite ensued on the worm bait, and it was that surprise capture – a barbel of 2-3oz! Now, although the species list of this pool does say barbel are present (and have been on that list since at least 2011 when I joined the club), I’ve not heard of any being captured… or being recently stocked come to that. Which makes for wondering on where this fish came from? There was a big restocking undertaken on our pools in the winter of 2011-2012 but I’d not heard of any plans to stock barbel – but maybe a ‘rogue’ in a batch of chub that were added? Other possibility would be that against all the perceived wisdom that says that barbel can’t spawn/breed in stillwater this is the result of an ‘exception’? Whatever, it was a pleasant surprise and I hope to renew our acquaintance when its a bit bigger!! 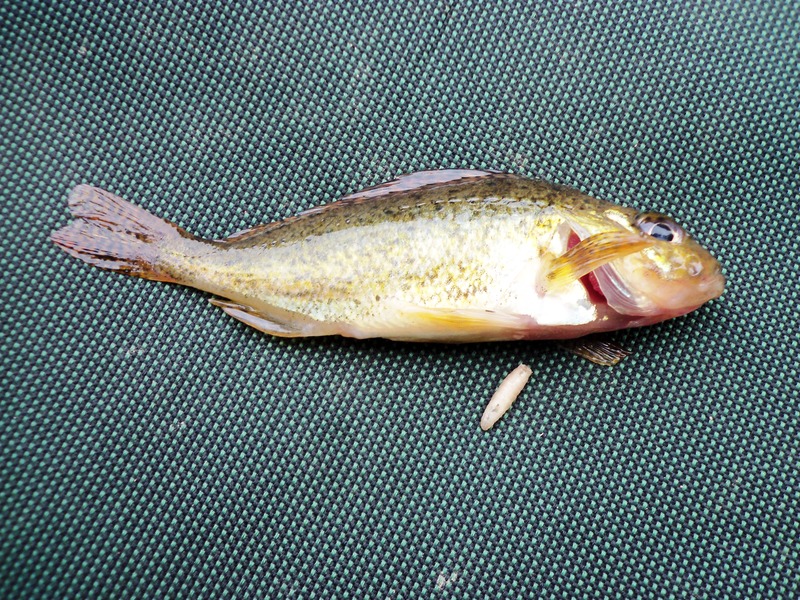 1345 – A perch of similar size to the crucian carp was lost when it rolled on the surface and managed to throw the hook … worm/maggot cocktail. Packed in, ready for home, at this point. Was a very good day – interesting catches – but at times it could have been a little warmer. White cloud overcasted mainly – and a chilly north wind in the face added a cooling effect – when the sun broke through it got quite warm but quickly chilled again when clouds passed.